On Thursday, Joseph Edward Root will walk out at Lord's to toss the coin as the 80th man to captain England in Test cricket. Tipped for the top job long before Alastair Cook resigned in February, a quirk of the fixture list has meant a five-month wait for Root to lead his country against South Africa. The 26-year-old is a prolific run-scorer, a proud Yorkshireman and a new father - that much we know. Here, those who have been with Root at key moments in his life reveal what has made him into a leader; from the baby with a bat in his hand, to teenage prodigy, a "cheeky chappy" who became a captain. Root's grandfather was one of five boys, all of whom played cricket. His father Matt, good enough to represent the MCC at Lord's, turned out for Sheffield Collegiate, the club that produced former England skipper Michael Vaughan. Root's younger brother Billy currently plays for Nottinghamshire. "I made him a little cardboard bat and he had it in his hand on the day he came out of hospital," said Matt. "As soon as he could walk, we put him into one of those things where he could wheel himself around and he was whacking furniture with a bat. "When he was old enough, he would field when the Sheffield Collegiate first team were netting, then he would insist on having some throw-downs until it went dark or the thrower got tired. On Saturdays, I'd be playing, Joe and Billy would put their stumps in on the other side of the boundary and have their own game all day. "When Joe was about eight, I was playing for the Yorkshire League against the Bradford League. We were fielding and the ball went towards the boundary. He ran on to the pitch, picked it up and threw it in, straight into the wicketkeeper's gloves. He got a round of applause from the crowd. "He was opening the batting in under-13 cricket at the age of nine or 10. He was very small, so the ball was always around his shoulders. That's probably why he's so good off the back foot now. "Joe just used to grind out runs. He really, really didn't want to get out. He loved batting at a really early age. More often than not he'd be run out, either because he didn't cover the ground very quickly, or team-mates would get fed up with him occupying the crease all the time. "There was always cricket, but Joe also played football for Nottingham Forest under-eights. He packed it in because it interfered with his Sunday morning nets. "When he was about 11, I asked Joe what he wanted to when he grew up. He said he wanted to play for England. Someone has got to do it and, maybe because he'd seen Michael Vaughan do it, he didn't see any reason why he couldn't be one that got the privilege." 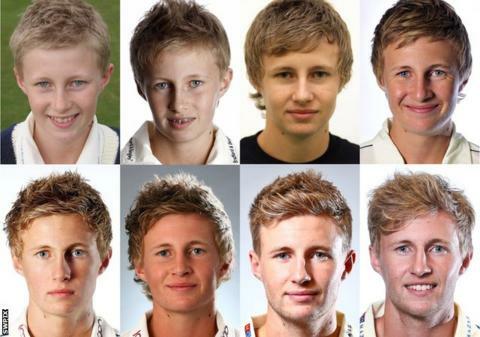 At 13, Root became the youngest player to be given a scholarship by Yorkshire. As part of his introduction to the club he went to Headingley one winter evening to meet batting coach Kevin Sharp. Before the meeting, ex-Tykes batsman Sharp had been working with Anthony McGrath, who played four Tests for England in 2003. "The way he talked, he could have been an adult," said Sharp. "He knew the strengths of his game, what he needed to work on in order to get better. It was quite remarkable. I thought 'if he can bat as well as he can talk, he's going to be very good'. "He said he wanted a challenge, the same session that [former Yorkshire captain] McGrath had just had. I'd been training McGrath for Championship cricket, bowling with a new ball off only eight yards. I said to Joe 'we can't do that, I'll hurt you'. He just smiled and said that he'd be all right. I said 'put all your protective equipment on, because I'm coming for you'. "We had 20 minutes of very quick, very intensive stuff and Joe dealt with it unbelievably well. He had a great technique. He knew when to play, when to leave. He loved the short ball. I bowled a bouncer, which I shouldn't have done because if it had knocked him out I would have lost my job. It clipped his helmet grille. He just smiled and said 'that was a good ball'. "He always challenges himself to get better, practises out of his comfort zone, as if he is getting ready for the next level. He makes training harder than matchplay, so he is prepared for whatever may come. "Once, when he was about 17, we were on a pre-season tour to Barbados. We were at the Three Ws ground [named after Windies legends Frank Worrell, Everton Weekes and Clyde Walcott] and there was a dark indoor school with a concrete floor. He went in and set up an eight-yard pitch, put his gear on and then came to me with a new ball. "He said 'coach, we're going to play Test cricket for 15 minutes. All you have got to do is run in and hit me on the head'. "I did as he asked. I hit him on the head, the chest and the throat. He just kept smiling and nodding at me. After 15 minutes, I said 'I've done what you asked. I've hit you on the head four times'. "He said 'I know, but you haven't got me out'." Root made his Yorkshire debut in 2009 at the age of 18, scoring 63 in a one-day game against Essex. Less than two years later he was opening the batting for England Lions in a side captained by fellow future Test batsman James Taylor. "When people say that he arrived in the England team as a fully formed batsman it makes me laugh, because we never saw it with the Lions," said Taylor. "When he went on to play for England, we were thinking 'where has this come from?'. "I didn't see that period of progression from Lions to England. When I saw him playing for England I was thinking 'how's he got this good?' We were all baffled because we didn't see him growing up and all the hard work that went into it. We saw a guy that, in the Lions, was technically good but didn't score too many runs. Underneath that, the talent was unbelievable. "We played with him a fair amount and never saw him being that good. It was phenomenal how quickly he learned and progressed. "I'm a big believer that the best players are the quickest learners, and Joe is an exceptionally quick learner. He went on England's tour of India in 2012 and that's where he made massive strides forward, making huge progress in the nets. "He didn't play in the first three Tests. Some people, when they are out of the side just think 'oh, I'm carrying the drinks' and they sit on their backside wishing they were playing. "Others use that time to learn, work hard, get better and fitter. Joe did that and that was the difference between having the potential to be exceptional, and actually being very good in the England team straight away. Not many people perform on debut and Root did it." Root, aged 21, had only played two full seasons of first-class cricket when he was called into the England squad for the tour of India in late 2012. His selection was more on potential than weight of runs. That summer, he had managed 738 in Division Two of the County Championship. He joined a team full of Ashes winners that had topped the world rankings in the 12 months beforehand - the likes of Cook, Kevin Pietersen, Matt Prior and Graeme Swann. He was such a rookie, that some of them barely knew who he was. "I'd never come across him before that tour," said Swann. "I knew his name, but knew nothing about his game. When he turned up I thought 'brilliant, we've got a mascot to take on tour with us', because he looked about 16 at a push. "When you haven't seen anyone before, you sum them up the first time you bowl at them in the nets. Straight away I thought 'wow, this kid can actually bat'. Instantly he was the best player of spin in the team. He was very confident, punchy and almost arrogant in a good way. "I think all the bowlers were chivvying Andy Flower, the coach, saying that we had to get him in the team because he was brilliant. I certainly was. "In the dressing room, it was like having your cheeky little brother around. He was always there being a pest, doing stupid little jokes, or getting stuck into the cake trolley. He was a breath of fresh air compared to a lot of youngsters who were straight-down-the-line robots. "From the first time I saw him in the nets I thought he would be an England player for the rest of his life. That was confirmed after he had faced about 15 balls in his first Test." Root made 73 on debut in the final Test as England secured a first series win in India for 27 years, and was in the side for the back-to-back Ashes series that followed. However, with England having a miserable time down under in 2013-14, he was left out of the final Test in Sydney. His return at the beginning of the following summer sparked a remarkable period of run-scoring. Just over a year later, he was ranked as the number one Test batsman in the world. "It wasn't like he was getting dropped and being tossed aside," said England fast bowler James Anderson. "It was pretty obvious he was going to play a big part in the future of English cricket, but he was still very young. It was probably a clever thing to take him out of the firing line in order to look after him. "Clearly, it wasn't a great trip. When you're 20 years old, all you want to do is go out there and play cricket. At the same age I was at the 2003 World Cup in South Africa and we had all the distractions of whether we should go to Zimbabwe or not. It was probably a shock for Joe that international cricket isn't just turning up and scoring runs. "I remember how hurt he was when he did get dropped. He has always been desperate to play for England and to get a taste of that and then have it taken away can be difficult to deal with. I think that showed in the way he went away and worked on his game. He went to the relevant coaches and picked some brains to figure out what he could do to develop his game. "I like the way that he prepares individually for series - he knows who he is going to come up against, so he'll tailor his game. That's something you think is a given in a lot of players, but even in international cricket you'll see some that, once they have had a few good scores, they will keep practising nicely at the things they are good at. "Joe is someone who takes himself out of his comfort zone in practice. It's tough to bowl to him in the nets. I always think I can get him out, but then there are times when you can see how good he is. He's probably not the best guy to bowl at when you're trying to build confidence in preparation for a Test. "People talk about Joe, Virat Kohli, Steve Smith and Kane Williamson as the best four players in the world. If Joe was to rank them, he'd put himself at number four. He's that sort of person. Because he's quite shy, I don't think he likes that praise too much." Root was named England vice-captain in the summer of 2015, confirmation that he was Cook's successor-in-waiting. When Cook resigned in February this year, Root's elevation was close to a formality. He was made skipper a month after the birth of his first son, Alfred. "He's always been the cheeky chappy off the field, in the dressing room and even on the pitch," said England all-rounder Chris Woakes. "He's always smiling and joking around. I think that's his way of staying in the zone, not getting too serious. "People talk about him being a prankster, but that's not what I see in Joe, it's more the banter. He's very happy to give it out in the dressing room, but he also occasionally keeps himself to himself, especially on tour. "You might not see him for a couple of days and you might think 'where's Rooty been?' There was one tour when he was in his room for a couple of days and the lads were calling him Casper the ghost. Then, all of a sudden, he's at the forefront again. He probably needs to take himself away, have his little bit of 'me time', then come back champing at your heels again. "Being a dad has matured him a fraction. From a social side it does change your life a bit - you're not always going to be the first one in the bar. You have other duties. Still, he's very much a team man and will try to spend as much time with the team as possible. "Fatherhood will help his time away from cricket. As an international, you're always thinking about cricket, so that might be good for him to get away from it. It might even help his batting. "He hasn't changed in the months since he was made Test captain, but that will probably have to come because captains need to have difficult discussions with players. I think he'll embrace the job and I'm sure he'll pick the brains of Alastair Cook. The more he stays himself, the better he'll be." Additional reporting by Tim Peach. James Taylor was talking to BBC Test Match Special.